Together we work one-on-one to unearth your dreams, desires and your inner goddess to create the life you SO deserve. Live and virtual gatherings of like-minded women supporting one another on their journey to a more heart-centered life. 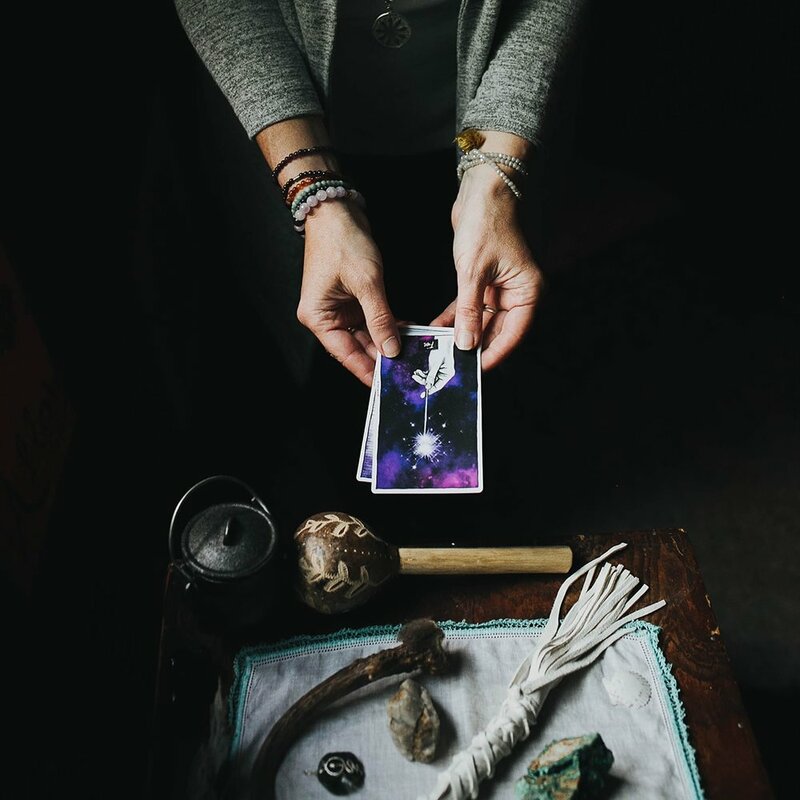 Deeply transformative and intuitive, my work includes Reiki, intuitive energy work and aromatherapy to meet you wherever you are in your journey. Are you ready to be done with the feelings of being stuck, tired, overwhelmed and/or resentful? Have you read all the “self-help” books you can get your hands on, but are still feeling lost and unsure how to create the change you know you desire? I know exactly how you feel and I have been there. It would be my honor to support you on your journey of self-discovery. Yes, I said self-discovery. News flash! You have what it takes to feel exactly how you want to feel. It is all within you. All the answers. Together we can work to unearth them and your inner goddess to create the life you SO deserve. In our time together you will create a deep connection with your own soul’s voice, your intuition, and discover how to ask and receive answers to all your deepest questions. You will learn to love and care for yourself on a whole new level. The truth is my beautiful friend, you are SO worthy of your dreams and desires. You deserve to be joyful and at peace in your own life. What are you waiting for? Let’s get this party started! I can’t wait to dive in. It all starts with a COMPLIMENTARY 45 minute Soul Call to explore if my magical kind of juju jives with yours. Click here to schedule a call. A one month exploration into connecting with your soul’s voice, your intuition. A three month exploration of your soul’s voice and how to begin leading a heart centered life. A six month journey to connect with your soul’s voice and create a heart centered life. A complimentary 45 minute casual conversation where we talk about what you are looking to accomplish and how I might be able to support you. There is nothing like gathering groups of women to support each other on their journey. That is why I love offering virtual and live group programs. In my programs we explore ways to connect more deeply with intuition and live from a heart centered place. One of my favorite things to share is energy work. I am an intuitive energy healer. I use Reiki and my own intuitive gifts to assist people in healing. I am a level 2 practitioner and a member of the Vermont Association of Reiki Healers. Love, Light and Healing is a beautiful, healing hour long energy healing session. During out time together we will explore what your intentions and desires are for healing to get started. I will then begin a 30-40 minute long intuitive energy and crystal healing session. When the healing session feels complete I will share the intuitive downloads that came to me during the session if you wish to hear them. To finish up our time together I will do a Tarot card reading for you. Raindrop Technique is a 90 minute healing session that employs, energy healing, light massage and AMAZING essential oils to help relieve pain in the physical and emotional body, as well as helps you to reconnect with yourself and your sense of health and well being. Many of my clients find it to be "Pure Relaxation" Raindrop utilizes a sequence of therapeutic grade essential oils derived from plants. These oils are used on the feet, first by employing vita-flex technique and then dropped on the back through your aura in a meditative way to stimulate the nervous system. The essential oils are then gently feathered on your back which disperses the oils along the nervous system. This allows you to deeply relax and supports the body to release tension as the oils are gently feather-stroked along the spine and absorbed into your entire body. Along with this feathering process, you receive acupressure, gentle massage and hot towels in this session, however this is more than a massage, as it is primarily a spiritual energy session. It supports your mind, body and spirit to heal in whatever way it deems necessary. Raindrop Technique generally uses a series of 9 Essential Oils (including 2 proprietary Young Living Essential Oil blends and 7 single essential oils). The Essential Oils are immune enhancing and support the body's natural defenses as they high in antioxidants and are antiseptic, creatingan unfavorable environment for harmful viruses and bacteria that can hibernate in the body. The essential oils chosen support the circulatory, respiratory, endocrine, digestive, and nervous system, as well as help reduce inflammation and pain in the body. Whether you are looking for relief from physical pain or emotional healing, this session is for you. If you have any questions, please feel free to email me using the contact link below.